It’s good to know that theatre directors are only human too – anyone in their right mind who watched Channel 4 drama Humans over the summer would have noted Gemma Chan delivering one of the performances of the year in any medium and naturally wanted her in on their projects. She has been working for a while in film, TV and theatre but now she’s now appearing in Harry Potter spin-off Fantastic Beasts and Where to Find Them and Jamie Lloyd has secured her services on stage in his new production of The Homecoming. Truth be told though, I needed someone that exciting to tempt me to see it as I don’t much get on with Pinter, I’ve never had that breakthrough moment with any of his works to make me what received wisdom assures me is there. And whilst I wouldn’t go quite so far to say I’m a complete convert, I can honestly say I haven’t ever enjoyed a Pinter production as much as this one. 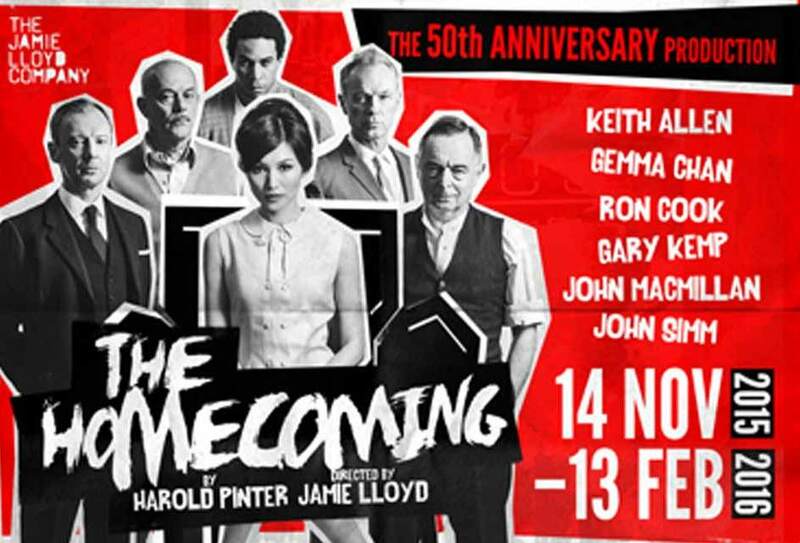 It’s the 50th anniversary of The Homecoming but though firmly anchored in its 1960s milieu, Lloyd imbues the play with a strongly contemporary dramatic feel that is hard to resist. From the forced perspective of Soutra Gilmour’s metal-framed floating set to the blood-red colour washes of Richard Howell’s striking lighting design, there’s a powerful, modern visual aesthetic, a bare minimum of furnishings to evoke the working class North London living room but still leaving an unmistakable sense of what it is trying to achieve. And though Pinter is famed for his pauses, Lloyd finds his own, speedier, rhythm in the writing (something I suspect may ruffle the feathers of more senior critics), punctuating scenes with private character moments. And what characters. Ron Cook pours viciously crotchety patriarch Max full to the brim with toxic vitriol, lean like a mongoose he oozes menace from his special armchair and is perfectly matched with a never-better and crisply spoken John Simm as middle son Lenny, coiling himself meticulously around the situation like a cobra eyeing its rival. Into this melting pot of antipathy arrives eldest son Lenny (Gary Kemp needing to ramp up the intensity for my liking) after six years away in the US with his wife Ruth in tow, a marvellously self-possessed Chan, shifting the already twisted sexual dynamic in the household. The casting of Chan toys with the notions of otherness that Michael Attenborough similarly hinted at when he directed Jenny Jules in the role at the Almeida, reinforcing the men’s misogyny with overtones of racial prejudice and preconceptions. But as with Jules, Chan heightens the enigmatic pull of Ruth, flirting beautifully and dangerously with Simm’s astounded Lenny and then insinuating herself into the heart of the household with a coldly contractual eye and an absolute sense of pragmatism. For me, it just works in a way I scarcely comprehend but certainly appreciate. Could I really say how Lloyd has made me like Pinter? I’m sorry, I don’t understand the question.